While the so-called Family Smoking Prevention and Tobacco Control Act—the bill giving the FDA the power to regulate cigars—didn’t pass until June 2009, the legislation controversially set February 15, 2007 as the cutoff date for tobacco products to be grandfathered as exempt from needing FDA approval before being sold or marketed in the United States. There were hopes the FDA would modify that date, but they did not. As a result, products introduced past that date will be subjected to the FDA approval process. We don’t yet know what that approval process will look like—or how long it will take, or how expensive it will be—though I wouldn’t hold out much hope for anything reasonable. The FDA has made clear they have no intention to be sensible when it comes to handmade premium cigars. Therefore, we may soon need to come to terms with a (severely) narrowed selection of cigars, cigars that have been on the market for over nine years. With a release date of October 2006, the Tatuaje Havana VI just barely makes the cut. If, like me, you hadn’t smoked (or thought about) this line for years, let me provide a little background. The Nicaraguan puro sports a Corojo ’99 wrapper and is intended to be a wallet-friendly, more medium-bodied alternative to other Tatuaje smokes. It originally came in six sizes—Hermosos (5.6 x 46), Angeles (4.6 x 42), Victorias (6 x 38), Artistas (6.1 x 52), Nobles (5 x 50), and Almirante (7 x 47)—with the first letter of each spelling “Havana,” the name of one of Tatuaje founder Pete Johnson’s dogs. The Churchill-sized Almirante can be found for around $7-8. It’s a beautiful, slightly reddish, somewhat dark specimen with plenty of oils. The perfect triple-cap clips cleanly to reveal an easy cold draw. Pre-light aromas at the foot remind me of sweet hay and cocoa powder. The first third of the cigar is characterized by flavors of spicy cedar, a little white pepper, dry oak, and a satisfying sweet creaminess. Caramel, red pepper, and roasted nut join the fray after an inch. Then, at the midway point, the Almirante begins to shine. Cocoa, cream, and peanut take center stage, rendering the smoke less spicy yet full of interesting flavor. The final third brings about the reappearance of dry wood and cedar spice with some black pepper. 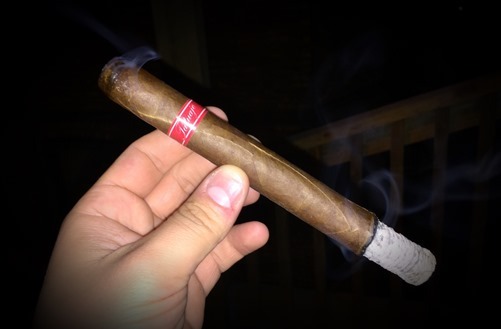 With excellent construction throughout—including a solid white ash, a straight burn line, good smoke production, and a smooth draw—it’s clear this cigar brings considerable quality and enjoyment to the table, all at a reasonable price. FDA awfulness aside, the Havana VI line is worth another look if you haven’t smoked this blend in a while. The Almirante is worthy of four stogies out of five. I have long been a fan of this line, and have smoked more of them than any other Tatuaje, largely due to price.